Last spring, life took a major turn. After 12 years as stay-at-home mom and freelance writer and speaker, I went back to work part-time in an office. Now I was wife, mom, freelance writer and speaker, and a marketing/communications coordinator for twenty hours a week. Change is never easy. Even good change. I wrestled with a pile of emotions from deep joy to see God provide and answer our prayers for provision to feelings of fear and worry that I wouldn’t be able to handle it all. Not to mention all the mom-guilt that just seems to hop on whenever it sees a chance for a ride. 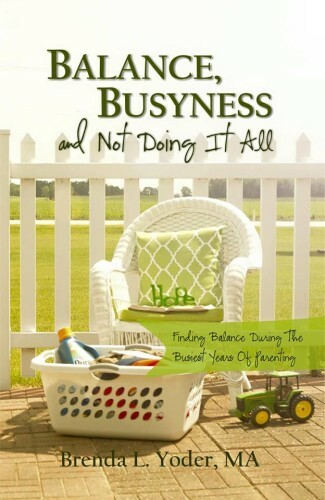 Then my friend Brenda Yoder asked me to be an early reader for her new book Balance, Busyness, and Not Doing It All: Finding Balance During the Busiest Years of Parenting . The title alone made me eager to read. The content rocked my newly changed world. She reminded me that my identity is found in Christ. Not my roles as mom, wife, writer, speaker, marketer, employee, or friend. Just Christ. I’m a doer. Being? Not so easy. And that was only page 21. Every time I read that, I want to weep. Use both my strengths and weaknesses for His glory? If you’ve ever heard me share my testimony, you know I spent most of my life battling perfectionism and the resulting anxiety. I’m about being strong, hiding my weaknesses, and having it all together. 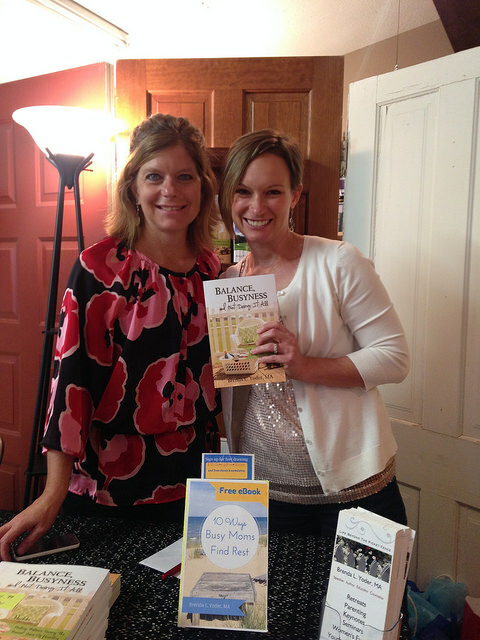 Me with Brenda Yoder at her book signing. Photo by Little Miss. I highlighted the whole chapter. She goes on to redefined our weaknesses as “lesser strengths” and gives practical tips for letting go of those lesser strengths and asking your family for help in those areas. I have a LOT of lesser strengths. Unfortunately, cooking and meal planning are two of them, and for some reason, the people in my house want to eat dinner every. single. night. Learning to let go of my lesser strengths and engaging my whole family in the meal process has rocked my world. Yes, God will even meet you in meal planning. I promise. I could go on about how much this book has impacted me. But really, you should just get your own copy (On Amazon or on Brenda’s site). The last half of the book is “10 Practical Principles for Prioritizing Busyness” which includes topics of marriage, learning to say no, managing your home, the never ending to-do list, tacking the outdoors, and special words for working moms. Brenda is graciously giving away one copy of Balance, Busyness, and Not Doing It All to one reader! To enter, use the widget below for many ways to enter the drawing, or simply leave a comment on this post. I will draw the winner Sunday evening and announce it here next Monday, September 14. 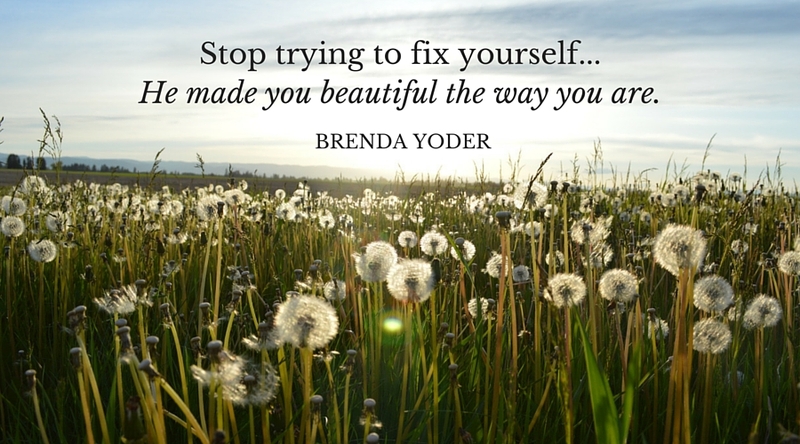 Brenda L. Yoder, LMHC, is an author, speaker, educator and counselor. Her books, Balance, Busyness, and Not Doing It All and Who Do You Say I Am released in 2015. Her ministry, Life Beyond the Picket Fence, can be found at brendayoder.com where she writes about faith, life, and parenting beyond the storybook image. 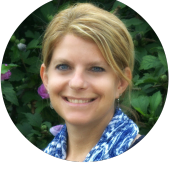 Brenda’s also a parenting columnist for 10 To 20 Parenting, Choose Now Ministries, and Whatever Girls, She has a mental health column in her local paper, and has been featured in Chicken Soup For The Soul:Reboot Your Life. She was twice awarded the Touchstone Award for teachers. When Brenda’s not writing, working, or speaking, she’s a wife and mom to four children, ages teen to young adult. You can connect with her on Instagram, Facebook, Pinterest, Periscope (@BeyondPicketFenc) and Twitter. I would love a chance to win this book. Thank you for this opportunity. Perfectionism, balance, giving God both my strengths and weaknesses – yup! That’s me! Cheri, What I love too is that Brenda speaks as one who has been there. She gets the struggle and offers such hope and practical encouragement. You will love the book, and Brenda! Cheri, you’re not alone, that’s for sure. Thank you for sharing these! Erin, when I worked from home I struggled a TON with separating work and home life. It’s a very tricky thing to balance, especially when the kids are young and at home with you while you work. Brenda’s book offers great encouragement as well as practical helps. You would love it! And God has been working on me to let go of “stuff” to simplify. I didn’t think I was very attached to things, until I started letting them go. I cried. A lot. But it was very freeing in the end. Praying for you that God will show you how to balance! Erin, I think it will encourage you. It’s easy to get caught up in immediate demands that skew our priorities. You’re not alone! I soooo want to get this book! Even if I don’t “win” this book. I will be getting it! It sounds like right up my alley for what is going on in my life. Love your blog Amelia and your heart! Blessings girl! Thank you Wendy! You’re always such a sweet encouragement. I’m on my way reading through the book a 2nd time – that’s how much I need it! 🙂 You will love it! I hope the book can encourage you Wendy! I sooo need this book. With my life being busy with four kids I think I could use some help on how to keep it all going. Jennifer, Brenda has 4 children as well. She offers a lot of practical tips and help for handling family life and all the roles and responsibilities that go with being a mom. Yet she does so in a way that’s not overwhelming or burdensome or guilt-inducing. Jennifer, I can relate so much! The fourth child almost sent me over the edge. Parenting multiple kids at each stage is challenging! Just from your review Amelia, sounds like must/great read. I so need to read this. My Mom guilt loves to hitch a ride all the time too! Thanks Brenda, for something so needful and encouraging! Lisa, you’ll get to meet Brenda at Breathe. yay!! This sounds like a great book! Cooking and meal planning are some of my lesser strengths as well. I would love to hear how you have engaged your whole family in the meal process. Thanks for sharing. That sounds like great idea! You are probably not eating the same foods all the time either. YES! Balance is a struggle! But I’m getting better at it. I have to as my calendar gets fuller! This is such a timely topic for our day and culture – one in which I feel like I’m making progress, but still struggle!